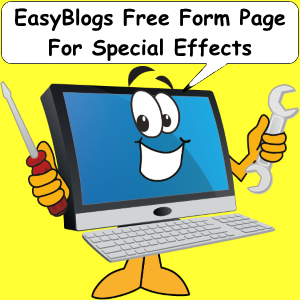 Free form page in EasyBlogs allows webmasters to create complete HTML pages from scratch including special effects. 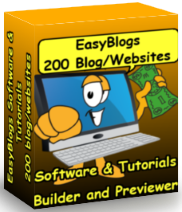 The free form page is here to show how capable EasyBlogs really is. I wanted to know for myself what could be done with this page so I made this one. What is free form? Free form is an artist expression meaning you are free to use any and all techniques associated with a particular genre. Example: in olyimpic skiing there is free style mogul jumping. In swimming there is free style racing. 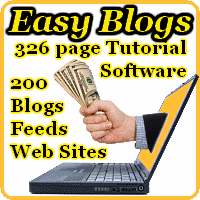 In EasyBlogs free form means a special page not pre-formatted. EasyBlogs is a template oriented html/cms editor. You create a template structure that builds the pages for you. The build process incorporates your content with your pre-built template. The editor generates all the pages everytime. This allows you to concentrate on just creating content. On this page we included several special effects that show off various techniques for enticing user involvement. Some are programmed into every page while others exist only on this page. Read on to see what cool tools are available. But! What if you have a special effect or application or content you want to incorporate into just one page? What if none of the template pages are suitable for what you want to do? What then? The free form page is not preformatted with any html code. This allows you to write the html and css code and the content all in same editor. This allows a webmaster to use more special applications if s/he wants. On this page for example I have includes a fadeIn jquery script that acts on a list. If you don't want every little program to run on every page then use a free form page. Then you can pick and choose which programs to run. This technique can improve page load speed. The special effect you see to the left is called a slider. It incorporates a jquery method that dissolves a series of pictures and captions and loops through them. You may not want this application on every page of your website because it tends to get annoying after a while. Page loading is very important to the speed of a website. Even the slightest slowdown can affect how a user uses the page. Which in turn can effect how high search engines rank the page. For this page we load all the special effects last. That way page load time is unaffected. All the content is displayed before the controlling scripts are loaded. This reduces the page load speed penalty. The free form page can be used for many different applications. You can add or change any metatag or add functionality. You can use special css styling only for one page. A good example would be a thank you page after a purchase is made. Great for electronic media and ebook sales. Another great usage would for a one of a kind page, like this one. One great feature of free form page construction is the ability to access include files. What's an 'include?' Glad you asked. An 'include' is a sub-routine called by a specially formed tag. Include files are small chunks of code that are typically reused repeatedly through out a website. Examples of this include navigation menus, promotions and special effects. The include file shown below is a promotion that appears on many pages in this website. Step by step instructions to create up to 100 blog/websites. Includes 326 page ebook. Home : Webstie Design : Free form page allows webmasters to include special effects or one of website pages. Get the best website tools, tips and techniques delivered to your inbox. Sign-up here! Don't worry -- your e-mail address is totally secure. I promise to use it only to send you Website Tool Tips.